BRUSSELS (Reuters) - The European Union wants Britain to stick to the bloc's rules on state aid, environment and workers' rights after Brexit to prevent it from gaining unfair access to the single market, diplomatic sources and officials told Reuters. The EU sees this as key to ensuring a "level playing field" should the so-called Irish border backstop kick in after Brexit, tying all of the United Kingdom into a customs zone with the bloc. "If you have a customs union-ish thingy, then that level playing field is a very important aspect. 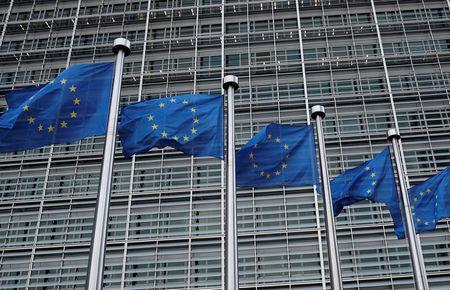 This is something we want to see there," a senior EU diplomat said. "Some member states have also mentioned fisheries." For the EU, agreeing to an all-UK customs union is difficult as it risks prejudging the bloc's future relationship with Britain. And Brexit supporters say such a backstop solution could leave Britain in a perpetual customs union with the EU they want to leave. If that is possible, EU and British Brexit negotiators would recommend that "decisive progress" has been achieved in Brexit talks and the EU would call a special summit of its 27 national leaders to endorse it. May has stepped up attempts to court European support for a Brexit deal as negotiations on securing a smooth British divorce from the world's biggest trading bloc enter their final stages.